Carte de l'Asie dressee sur les Relations les plus nouvelles, principalement fur les Cartes de Russie, de la Chine, et de la Tatarie Chinoise; et divisee en ses Empires et Royaumes. 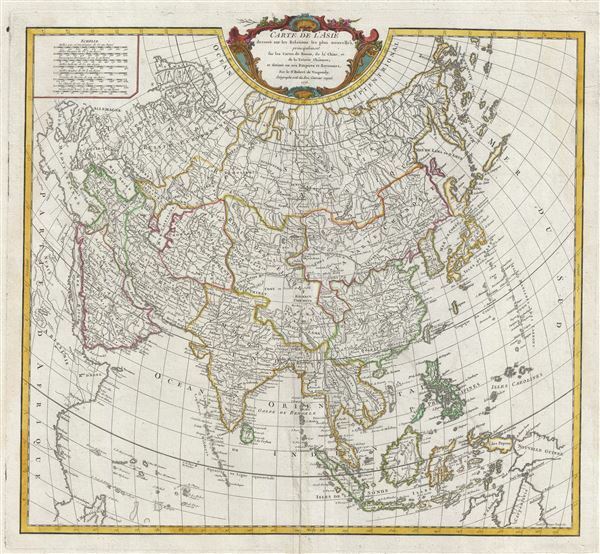 This is a rare and attractive 1775 map of Asia by Robert de Vaugondy. Vaugondy's map covers the entire continent from Africa and the Mediterranean east to the Bering Sea and south as far as Java and New Guinea. This map is most interesting in its rendering of the largely unexplored extreme northeast of Asia. Knowledge of this area was, at the time, speculative at best and Vaugondy presents a largely conjectural mapping of Japan, Hokkaido, Sakhalin Island and Korea. Further south New Guinea is presented in tentative form with its eastern border missing. Just to the east of Yedso (Hokkaido), Vaugondy maps the apocryphal Terre de la Compagnie or Terre de Gama. Terre de Gama and Terre de la Company, speculative mis-mappings of the Japanese Kuril Islands by the 17th century Dutch explorers Maerten de Vries and Cornelis Jansz Coen, appear just northeast of Yedso (Hokkaido). Gama or Compagnie remained on maps for about 50 years following Bering's voyages until the explorations of Cook confirmed the Bering findings. The map is such an example. The top center of the map is decorated with an elaborate title cartouche. This map was originally engraved by Guillaume Delahaye and drawn by Robert de Vaugondy in 1750. This is the 1775 state published in the 1757 issue of his Atlas Universal. The Atlas Universal was one of the first atlases based upon actual surveys. Therefore, this map is highly accurate (for the period) and has most contemporary town names correct. Very good. Some wear and verso repair along original lower 1/4 of centerfold. Minor spotting and offsetting. Original platemark visible. Rumsey 3353.088. Pedley, Mary Sponberg Belle et Utile: The Work of the Robert de Vaugondy Family of Mapmakers, 375, state 3.